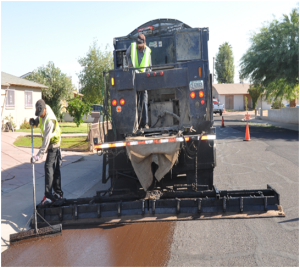 Asphalt emulsions serve as a binder, holding the crushed aggregate together and adhering the new slurry seal to the old surface over which it is being applied. Various emulsions and aggregates are used to meet the conditions, specifications, and requirements of individual projects. Aggregate types are I (fine), II (general), and III (coarse). Fine aggregate mixtures are used for maximum crack penetration and sealing in low-density/low-wear traffic areas. Type II aggregates are the most commonly used and are widely employed where moderate to heavy traffic is found. They seal, correct moderate to severe raveling, oxidation, loss of matrix, and improve skid resistance. Type III corrects severe surface conditions – preventing hydroplaning and providing skid resistance under very heavy traffic loads. The aggregate must be clean, crushed, durable, properly graded, and uniform. 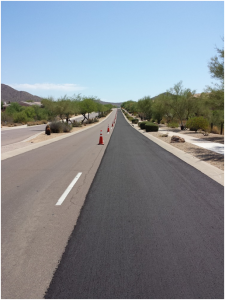 The asphalt emulsion is a three-part system consisting of asphalt, water, and emulsifier. Fillers such as Portland cement, hydrated lime or aluminum sulfate liquid are often used in small quantities as stabilizers or chemical modifiers. 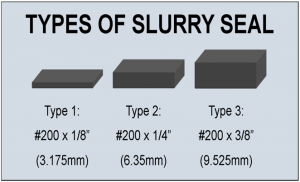 Slurry seal is today’s choice in providing highly durable, low-cost paving, and surface maintenance. As a treatment for everything from residential driveways to public roads, highways, airport runways, parking lots, and a multitude of other paved surfaces, slurry seal is now used extensively throughout the world. Local, state and federal agencies – including the military – have a growing and ongoing commitment to the use of slurry seal in their maintenance programs, attesting to its effectiveness and economy.